On March 23, 2001, Soviet space station MIR after more than 10 years of operation reentered Earth‘s atmosphere and crashed down in the Southern Pacific. 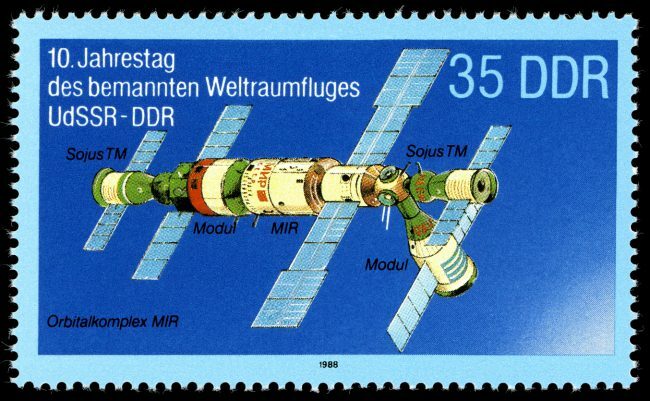 MIR  held the record for the largest artificial satellite orbiting the Earth until that record was surpassed by the International Space Station. Mir was the first modular space station and was assembled in orbit from 1986 to 1996. Its famous predecessor, the monolithic U.S.space station Skylab launched and operated by NASA and was the United States’ first space station orbiting the Earth from 1973 to 1979. But, the very first space station was the Russian Salyut 1. As well as Skylab , Salyut 1, which was launched by the Soviet Union on April 19, 1971, was “monolithic”, i.e. intended to be constructed and launched in one piece, and then manned by a crew later. As such, monolithic stations generally contained all their supplies and experimental equipment when launched, and were considered “expended”, and then abandoned, when these were used up. Actually there were several Salyut space stations: Salyut 2, Salyut 3, and Salyut 5, also known as Almaz stations were for military purpose, while Salyut 6 and Salyut 7 again were for civilian and research purposes. As a predecessor of the International Space Station (ISS), and unlike previous stations, the Soviet space station Mir had a modular design; a core unit was launched, and additional modules, generally with a specific role, were later added to that. This method allows for greater flexibility in operation, as well as removing the need for a single immensely powerful launch vehicle. Modular stations are also designed from the outset to have their supplies provided by logistical support, which allows for a longer lifetime at the cost of requiring regular support launches. After the construction of the ISS began in 1998, Russian resources were split between the two stations. In 2000, a contract was signed to lease the station for commercial use, with the Soyuz TM-30 mission, intended to prepare the station for future use and conduct some commercial research, being flown later that year. This was to have been followed by more missions, including flights with space tourists. However, due to the Russian government being concerned about the investors being able to fund these missions, it was decided against funding the continued operation of Mir. 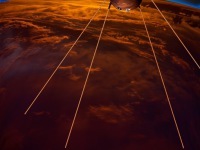 In November 2000, it was decided to deorbit Mir in a controlled way. By this stage Mir was well past the end of its design life. Therefore it was decided to deorbit it while it was still functioning rather than risk it falling back to Earth out of control, like Skylab in 1979 and Salyut 7 in 1991, potentially dropping debris over a populated area. Two out of three Progress M1-5 propulsion firings, at approximately 90 minute intervals, were used to bring the perigee of Mir down to an altitude of 160 kilometers above the Earth’s surface. 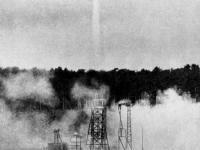 A tough contact with the atmosphere occurred at 100 km altitude, when some of the external light elements of Mir were torn off due to the rush through the rarefied air. At an altitude of 90 km sufficient heating from Mir’s hull created a glowing halo of hot plasma. At about that time, the orbital complex broke apart and several of Mir’s elements, surrounded by the plasma, were visible from Fiji against the evening sky. The entire process lasted from about 16:20 to 20:29 local solar time. 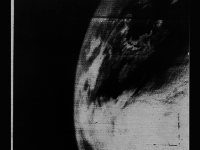 An official statement announced that Mir “ceased to exist” at 05:59:24 GMT. The location of Mir announced after re-entry was 160°W 40°S with a debris spread of ±1,500 km along track and ±100 km laterally. Salvage hunters managed to retrieve some sizeable chunks of Mir out of the Pacific Ocean. At yovisto academic video search you may be interested in a short introduction to the space station MIR by NASA astronaut David Wolf from 1997. The First US Space Station Skylab, SciHi Blog, May 25, 2014. The first Modular Space Station – Mir, SciHi Blog, February 19, 2014.